When the Dallas Stars switched Tyler Seguin to his natural center position and elevated him to the first line, his career took off. DALLAS — For nearly 60 minutes, Tyler Seguin made plays that belonged on Claude Julien’s blooper reel. Seguin swung his stick to try and jar pucks off opponents’ blades. He approached puck carriers backside first and bounced off his checks. He peeled north and blew his defensive-zone coverage. After an offensive-zone turnover, he hesitated before backchecking. It was SOS — Same Old Segs, the stuff that drove his former club cuckoo. Late in the third, with Ottawa’s Robin Lehner off for a sixth attacker, Seguin aimed for an empty net twice within 74 seconds. The Stars center iced the puck both times. His second whiff, a three-quarters fling that wobbled wide right, gave Ottawa an offensive-zone faceoff with 2.3 seconds remaining. Seguin faced off against Kyle Turris. Seguin scraped the puck into the corner. Time ran out. Dallas won, 5-4. Ten minutes later, two emergency medical technicians hustled into American Airlines Center’s home dressing room. A Dallas player was suffering from dehydration. Approximately 30 minutes after the win, the player emerged. A green bandage covered the hole where the EMTs had threaded the IV into his tattooed left arm. The previous morning, after reporting to the Stars’ practice facility, he had been sent home after vomiting. In that Tuesday game, Seguin landed just one shot on net. Jamie Benn, Seguin’s left wing, had one shot, too. It was the ninth time in his previous 10 games Seguin didn’t score a goal. But Seguin played 20:55, most of any Dallas forward. He won the late faceoff. When your employer believes you can be the NHL’s best, such plays are mandatory. Even if you’re dehydrated. On Tuesday, Seguin will welcome his former team to Dallas. The Bruins have found some traction. But for chunks of the first half, the Bruins needed speed, skill, and scoring — qualities Seguin brings in abundance. Seguin is tied for the league lead with 28 goals. He has 183 shots, second after Alex Ovechkin. Only 16 of his points have been on the power play. In five-on-five play, Seguin is averaging 1.66 goals per 60 minutes, more than Evgeni Malkin, Steven Stamkos, Patrick Kane, and Phil Kessel. Seguin possesses the puck more than he chases it, although he only needs an instant to lock and load his whippy, heavy shot. He is younger than every Bruin except Dougie Hamilton and David Pastrnak. Seguin, 22, is under contract through 2019 at $5.75 million annually. It is $4.75 million less than what Kane, Seguin’s Swiss lockout teammate, will make starting next year. It is only $1.75 million more than the Bruins are paying Loui Eriksson. The Bruins believed they were getting a sure thing in Eriksson: a second-line veteran who could score, pass, defend, and play in all situations. They moved Seguin partly because he was anything but a sure thing. A season and a half later, the trade is sprinting in the wrong direction for the Bruins. Eriksson is a good fit on the third line with Chris Kelly and Carl Soderberg. He’s the team’s third-leading scorer with 28 points. He’s averaging 17:54 minutes of ice time per game, second among team forwards. But the 29-year-old Eriksson’s skating is declining. He is under contract for one more season at $4 million. Reilly Smith is playing at his ceiling as a No. 2 right wing who benefits from playing with Patrice Bergeron. Joe Morrow is in Providence. Matt Fraser is in Edmonton, waived because he couldn’t get open to use his heavy and accurate shot. General manager Peter Chiarelli noted the organization’s concerns about Seguin’s off-ice activities factored in the trade. Chiarelli declined to provide examples of Seguin’s behavior. Had Seguin remained in Boston, he would have stayed at right wing. He would not have displaced Bergeron or David Krejci. It was the move to center, however, that ignited Seguin’s emergence. On the wing, Seguin moved in stops and starts. In the middle, Seguin flows constantly. This gives him the launchpad from which he accelerates to ludicrous speed. Dallas coach Lindy Ruff emphasizes a five-man pack. Like Julien, Ruff believes in offense from defense. When the Stars win the puck in transition, Seguin attacks up the ice with speed and numbers, just like Julien wants his players to do. “I think so. Yeah, I do,” Ruff said when asked if Seguin could have produced similarly in Boston. “There’s two things that play into it. Him and Jamie Benn have had a tremendous relationship. Could he have found somebody there? I think he could have. Claude’s system is not a lot different. He’s got some good players that were ahead of him up the middle when you’re talking Bergeron, you’re talking Krejci. Seguin couldn’t get enough reception at the vacation house to check his voicemail. After a 15-minute drive into Osterville, Seguin got the news from Chiarelli. He then spoke with Nill. He returned to the house. The party continued. The next day, Seguin returned to Boston. He cleaned out his apartment. Then he drove eight lonely hours home to Toronto. Anticipation coupled with anger. It wasn’t enough that the Bruins gave up on Seguin. They made it clear on “Behind the B,” their in-house television program, that they were quite comfortable with tearing Seguin down and leaving the pieces for all to see. The show also captured a meeting in Jersey City before the 2013 draft. Seguin heard about the show. He didn’t like it. He also heard the chatter about the Bruins hiring security guards in Toronto during the playoffs to make sure he was in his room. Not true, Seguin said. This weekend, Seguin will join Bergeron, his former center, in Columbus as an All-Star. For all his production, Seguin has underachieved. The Stars believe he has the power to do more. The Bruins went through this for three seasons. They loved his talent. They didn’t like his deficiencies: taking defensive shortcuts, not competing hard enough, not being professional. They worried he was content with being a 25-goal scorer when his ceiling demanded double. Moving to center, playing with Benn, the motivation of the trade, and maturation have made Seguin a better player than he was in Boston. But some bad habits remain. He has grown into 200 pounds of shredded Texas beef. If Seguin would pause, engage, and lean into his opponents, he’d be strong enough to separate players from pucks and go on the attack. Instead, he cheats. Dallas has the NHL’s No. 2 offense (3.13 goals per game). But they allow 3.27 goals per game, third worst in the league. After Sunday night’s 6-3 win over the Blackhawks, they are 2 points out of eighth place. Seguin has made the playoffs for five straight years. That streak is in danger. Nill likes to say that for three years, Seguin attended hockey university in Boston, where he studied under instructors such as Julien, Bergeron, and Zdeno Chara. Seguin is in his fifth NHL season. He is still in the first stages of a life reboot. The juvenile Twitter account that once blipped out homophobic tweets is now Version 2.0. It is a PG collection of Dallas Stars Foundation retweets, product endorsements, and fan pictures. 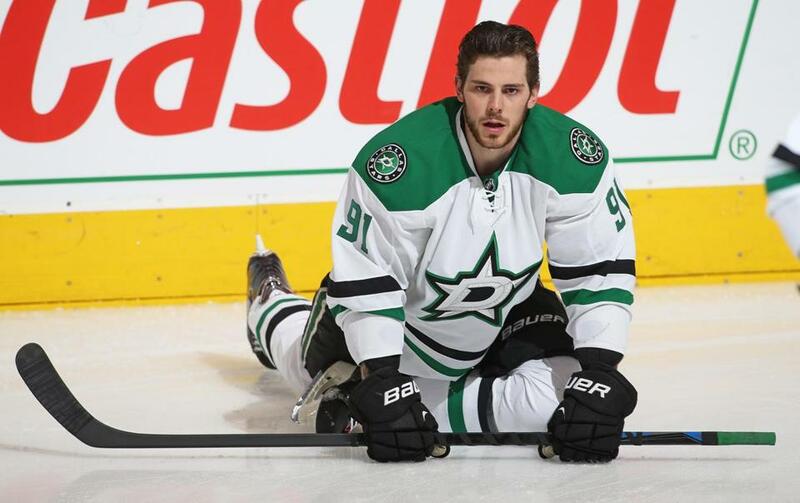 He started Seguin’s Stars, hosting patients with spinal cord injuries at home games. It is in honor of his close friend Derrek Moseychuk, who was injured in a car accident while Seguin was still a Bruin. On Dec. 1, Seguin’s marketing team launched his website. It includes quotes from Seguin on hockey, stories on his career, and pictures of the tattoos that snake around his arms. His most recent tattoo is on the inside of his right arm. It is of Toronto’s CN Tower and the street signs from his childhood home. For now, Seguin said he is finished. There is no space remaining on his arms. It’s not so with his career. He will turn 23 on Jan. 31. A blank canvas, smooth and white as a freshly made sheet of ice, lies before him. Seguin can turn it into anything he wants.